Temperance Creek is the best book I have read all year. Pamela Royes' memoir takes place near Hell's Canyon by the border of Idaho and Oregon. It is there she meets a Vietname veteran with whom she falls in love. Royes writes about their escape from society, their desire to live off the land, and their adventures of love and survival. Her lyrical writing flows beautifully, making it hard to put this book down. In the early seventies, some of us were shot like stars from our parents' homes. This was an act of nature, bigger than ourselves. In the austere beauty and natural reality of Hell's Canyon of Eastern Oregon, one hundred miles from pavement, Pam, unable to identify with her parent's world and looking for deeper pathways has a chance encounter with returning Vietnam warrior Skip Royes. Skip, looking for a bridge from survival back to connection, introduces Pam to the vanishing culture of the wandering shepherd and together they embark on a four-year sojourn into the wilderness. From the back of a horse, Pam leads her packstring of readers from overlook to water crossing, down trails two thousand years old, and from the vantages she chooses for us, we feel the edges of our own experiences. It is a memoir of falling in love with a place and a man and the price extracted for that love. 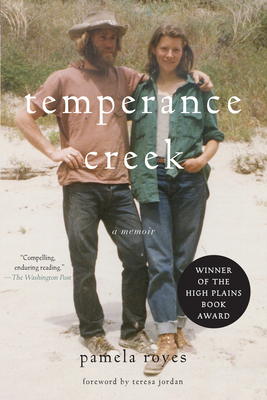 Written with deep lyricism, Temperance Creek is a work of haunting beauty, fresh and irreverent and rooted in the grit and pleasure of daily life. This is Pam's story, but the courage and truth in the telling is part of our human experience. Seen through a slower more primary mirror, one not so crowded with objectivity, Pam's memoir, is a kind of home-coming, a family reunion for shooting stars. Pamela Royes and her husband raise cattle and hay. They have two children and three grandchildren. She is currently working on a book of fiction. They live in Joseph, Oregon. Teresa Jordan is an artist and author who grew up in a house full of books on an isolated ranch in Wyoming where the love of learning she acquired in the local one-room school carried her to Yale and into a lifetime of inquiry. Her books include the memoir Riding the White Horse Home and two illustrated journals, Field Notes from Yosemite: Apprentice to Place, and Field Notes from the Grand Canyon: Raging River, Quiet Mind. Her first book, Cowgirls: Women of the American West, was one of the earliest books to give voice to contemporary women working on the land. With her husband, Hal Cannon, she created the series "The Open Road" about the outback American West for public radio's "The Savvy Traveler." She now lives in southern Utah near Zion National Park.